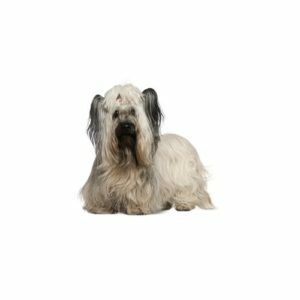 The Skye Terrier is an elegant dog and fiercely loyal to those he knows and loves. Although a rare breed, anyone who has the opportunity to share hearth and home with a Skye is truly fortunate. Given the chance, and with loving instruction, Skyes participate in Obedience, Agility, Tracking, and Pet Therapy, as well as serving as couch companions. One of the oldest terriers, the breed originated on the Isle of Skye off the west coast of Scotland. Bred to destroy vermin, their acute sense of smell and strong muscular bodies gave them the ability to locate the fox, badger, and otter preying on a farm?۪s livestock. Their long double coat and profuse hair over their face protected them from injury and inclement weather. Due to Queen Victoria?۪s penchant for the Skye Terrier, the breed became popular in the nineteenth century. A dog named “Greyfriar?۪s Bobby” epitomizes the devotion for which the Skye Terrier is known. Bobby guarded the grave of his master, Constable John Grey, for fourteen years until he died at the age of sixteen, after which a statue was erected in Edinburgh in his honor. Skyes are a medium sized dog with short legs, a long body, and a large head. The coat must be brushed several times a week to avoid uncomfortable mats and trimming is necessary to keep the hair from dragging along the ground. Terrier Group; AKC recognized in 1887. Ranging in size between 35 to 45 pounds. Elegant, dignified, agile; vermin hunter. The Skye Terrier is good for apartment life. It is relatively active indoors and will do okay without a yard. Are you interested in purchasing a Skye Terrier?